our commitment to our customers has not. 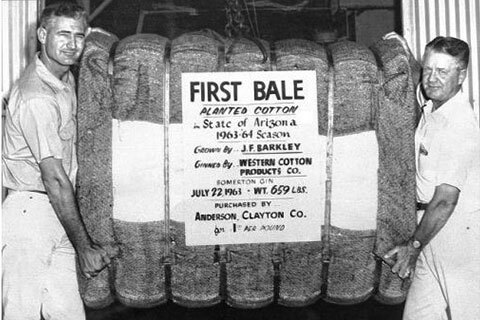 First Bale from the first crop of cotton planted in Arizona during the 1963-64 season weighing 659 lbs., grown by J.F. Barkley. Circa 1948, on Les Barkley’s farm in Somerton, Arizona. Caterpillar diesel D4 tractor with 8’x30’ wooden float, preparing land to plant lettuce. Loose soil was carried by the float until it filled low spots. Level fields conserve water, a concern than as it is today. 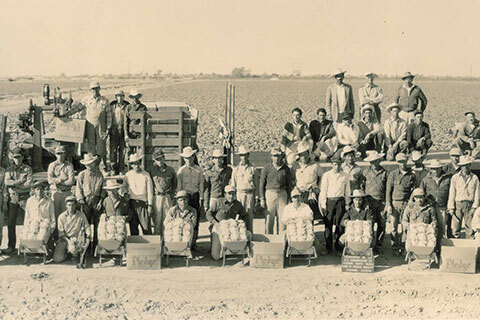 Circa 1940’s, men on one of Les Barkley’s harvesting crews proudly displaying beautifully packed iceberg lettuce. 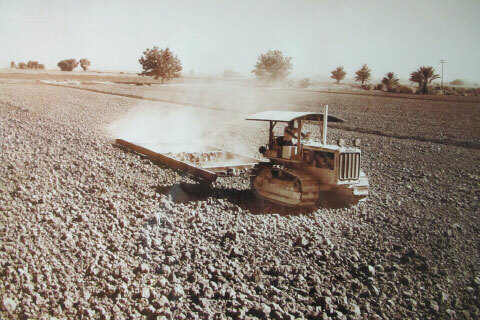 While the produce was palletized, the crews were considered ground crews since this was before the introduction of harvest machinery. Copyright © 2019 Barkley Company of Arizona, LLC. All rights reserved. Design by TMD.